Kerala is a south Indian state which is surrounded by Tamilnadu and Karnataka. It is also known as God's Own Country, Spice Garden of India, Land of Coconuts. It was formed on 1 November 1956. Area wise it is the 22nd largest state of India and 13th largest state as per the population. Malayalam is the main language spoken by the people of Kerala. Thiruvananthapuram is the capital of Kerala. Kerala has 14 districts- Kasaragod, Kannur, Wayanad, Kozhikode, Palakkad, Thrissur, Ernakulam, Idukki, Malappuram Kottayam, Thiruvananthapuram, Kollam, Alappuzha, Pathanamthitta. Kerala has the highest literacy rate in India. In 1991, Kerala became the first fully literate state of India. Besides having highest literacy rate, it also has highest HDI (Human Development Index) and lowest population growth rate. Kerala is the highest rubber and black pepper producer of India. Other agricultural products are – Different Spices, Coconut, Cashew, Tea, Coffee. Anamudi is the highest mountain peak of Kerala. Vembanad is the largest lake of Kerala and Periyar is the longest river. 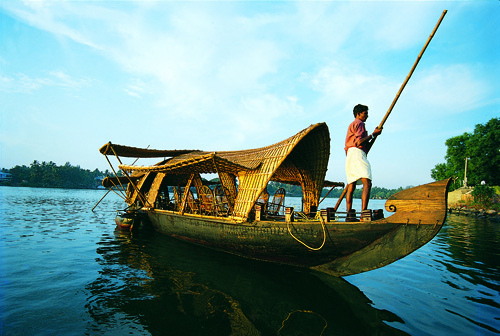 Kerala is known for its Backwaters among the tourists. It is a network of interconnected canals, rivers, lakes, and brackish lagoons. These are home of many unique sea animals. Different trees and plants surrounding the waterbody creates wonderful atmosphere for the tourists. Different type of houseboats float around this backwaters. It is the first Indian state which receives rains during the Monsoon. Most of the days (about 120-150) of Kerala are rainy in a year. Kerala is the most biodiverse state of India. Around 25% of India's 15,000 plant species are in Kerala. Kerala is famous for Indian elephants. Indian leopard, Nilgiri tahr, Bengal Tiger are also found in the forests of Kerala. Technopark of Thiruvananthapuram is the first technology park of India. It is one of the largest IT park of India. Most of the Keralite are emigrants working in foreign countries, mainly in Arab. Kerala is one of the most attractive tourist destination. It has beaches like Kovalam, Varkala, Vizhinjam, Hill stations like Munnar, Nelliyampathy, Wildlife Sancturies like Parambikulam national park, Silent valley, Backwaters like Alapuzha, Kollam. That’s why it is also called “God’s own Country”.